The below chart shows the relative popularity of the four largest carriers in the United States by BlackBerry 10 users. While there has been some month to month variation in general there is roughly an equal number of BlackBerry 10 users on AT&T, Verizon, and T-Mobile. The biggest surprise here is the relative popularity of T-Mobile among the BlackBerry 10 user base as it lags significantly behind the other two in overall subscribers. This data was collected by BlackBerry World for downloads of the free checklist app Stuff I Need. 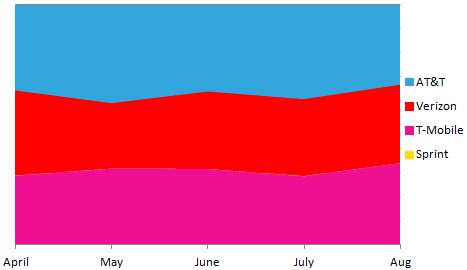 Data shown on the chart is from the beginning of April 2013 through the end of August 2013.